If you're a member of HubSpot's Marketing Agency Partner Program or an agency that's inbound certified, you can create a profile with your company information to share publicly on HubSpot's Agency Directory and make it easy for HubSpot customers to find you. 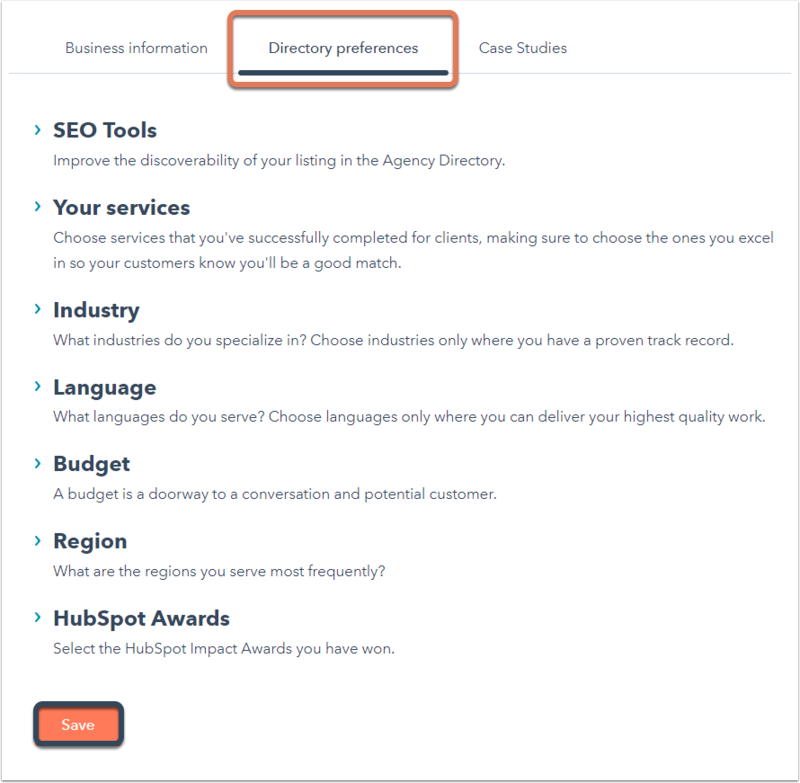 In your HubSpot account, navigate to Partner > Directory Info. After entering your business information, click to toggle the Publish your profile to the HubSpot Agency Directory switch on. SEO tools: Add a meta description to improve the discoverability of your listing in the Agency Directory. Your services: Select the service(s) that your company offers so customers can find a match for what they're looking for. Industry: Select the industry or industries that your company specializes in. Languages: Select the languages your company serves customers in. Budget: Select a budget range for your company's services. Region: Select the region(s) your company serves customers in. HubSpot Awards: Select the HubSpot Impact Awards your company has won (only available to HubSpot Partners). For more information and assistance with the HubSpot Agency Directory, check out the HubSpot Agency Directory FAQ.